Better Things Than The Flash? Hello! The first and the main question: what's your budget? 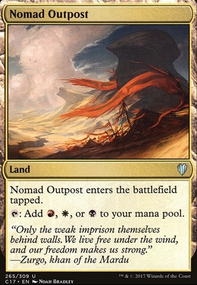 Because you need to fix mana base at first: Watery Grave , Drowned Catacomb or Darkslick Shores instead of those dual lands you have. Speaking about creatures: Cryptbreaker is one of my favorite zombies. Card advantage plus madness enabler - and very cheap. Unbreathing Horde isn't bad but Diregraf Colossus is much better. 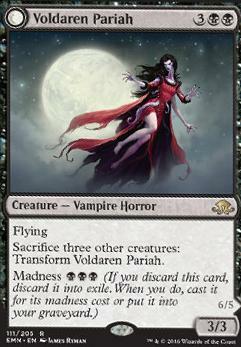 Voldaren Pariah Flip? Just because its madness cost and transforming effect? 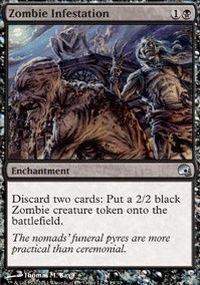 I think Grave Titan is better but it's a question of taste (and budget of course). You can also use Fleshbag Marauder + Gisa and Geralf . And what do you think about Endless Ranks of the Dead ? Some words about sideboard: hand disruption - Duress (but Thoughtseize and Inquisition of Kozilek are much - much! 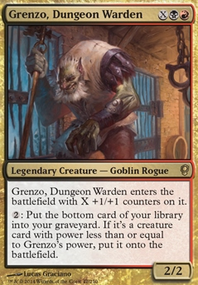 - better), control and discard - Compelling Deterrence (cheap and fun, yes), removal - Vraska's Contempt . 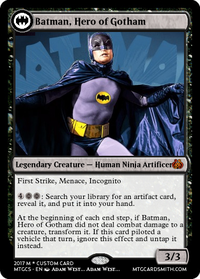 Some of those definitely seem like direct upgrades. I think I'll keep Underworld Connections , Profane Procession Flip and Oathsworn Vampire for now, as their replacements a little pricey. Voldaren Pariah Flip, Nirkana Revenant , Patron of the Vein , Big Game Hunter are great additions, will look to pick these up I think. Tragic Poet is just in there as a reusable way of getting back enchantments, maybe it's unnecessary. Thanks for the tip on the screen name, didn't realise it would be an issue. And again, thanks for the help. First, you seem to be missing 2 cards, you've only got 98 in your list. Reconnaissance needs to be in this list. It allows you to attack with every creature, untap to avoid bad blocks, untap after first strike damage but before normal damage, and even untap after normal combat damage is dealt due to the creature being 'attacking' until the end of combat step ends (you untap in the middle of this step). Card Draw is lacking, consider Herald's Horn, Necropotence, Dark Prophecy, Greed, and Twilight Prophet. 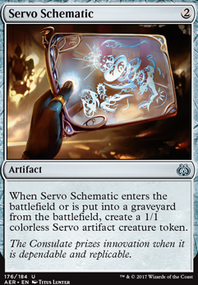 Boros Charm - wraths are the bane of this deck, protect your board. Talisman of Indulgence/Fellwar Stone both deserve spots. Shared Animosity needs to be in the deck, not just the maybe pile. 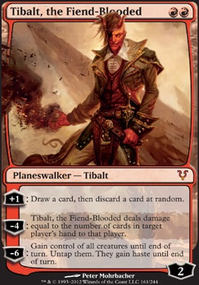 Diabolic Intent should replace Diabolic Tutor. 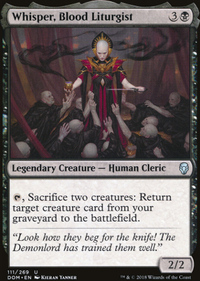 Sorin, Solemn Visitor is better here by far for his lifelink your team +1 than your 2 current Sorins combined. Now creatures... and I'd up your creature count to at least 33. Legion Loyalist, Rakish Heir, Yahenni, Undying Partisan, Mirror Entity, Dusk Legion Zealot and consider more flyers like Falkenrath Aristocrat and Voldaren Pariah Flip. Anyways, I hope this helps and feel free to check out my list for ideas. Edgar's Dega Vampires. Upvotes on any of my lists is appreciated.